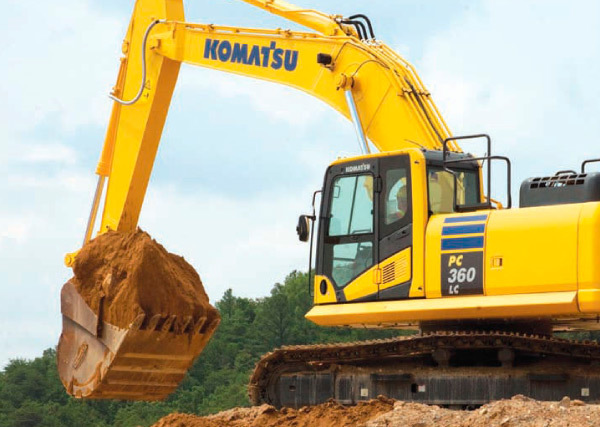 Hensley has been designing, engineering and manufacturing safe, reliable and productive G.E.T., wear parts and attachments for excavators for more than 60 years. Our innovative and proprietary designs help increase productivity, reduce costs and improve safety. Laminite® delivers the ultimate protection against impact and high abrasion in some of the harshest conditions. The result: reduced maintenance and less downtime. 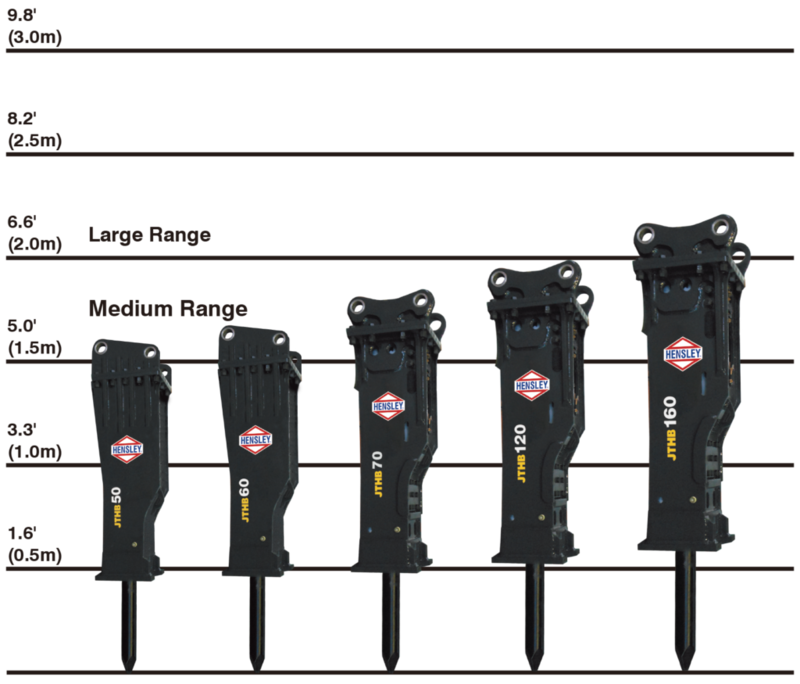 XS is Hensley’s patented system of ground engaging tools that takes strength, durability, performance and productivity to the extreme. Our engineers have analyzed where and how your machines work, and designed a system with a wide range of safe, economical and hard-working solutions. The XS System components deliver maximum wear and value to every application. To achieve the highest levels of productivity, attachments must be designed smart and built strong. 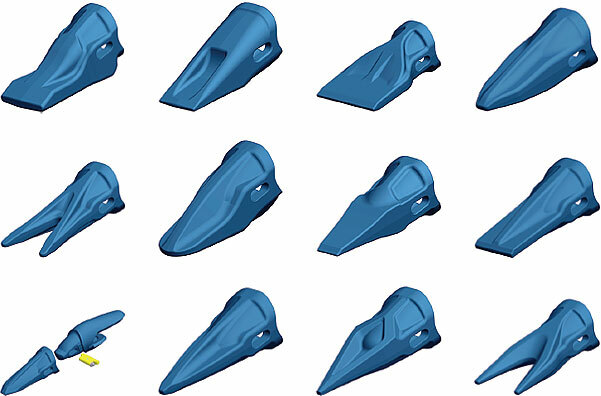 Hensley cast lip systems feature a streamlined design for better penetration. They are engineered of high quality steel for superior strength and wear resistance. Installation and replacement are safe and easy with the unique J-bolt pinning system. 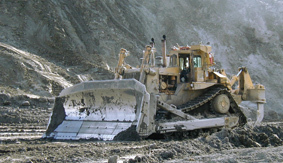 Hensley’s extensive line of ripper and edge protection systems offers a range of hard-working solutions for large dozers. 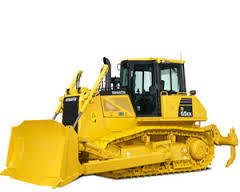 Repairs of damaged or broken dozer shank noses from small to large size dozers. Even in the most extreme conditions, Hensley wear protection products deliver exceptional performance and value. Easy to assemble and install, Hensley G.E.T. and wear products reduce downtime and maximize productive uptime. The Hensley system for wheel loaders features J-Bolt Lip Shrouds and Bolt-On Segments, a quick, safe, longer-wearing alternative to weld-on shrouds. Like all J-Bolt products, they are easy to assemble and install, reducing downtime. Laminite delivers the ultimate protection against impact and high abrasion in some of the harshest conditions. The result: reduced maintenance and less downtime. Hensley offers a complete line of direct replacement parts for mining G.E.T., and a wide selection of replacement parts for OEMs to be used with Hensley loader buckets and most other bucket brands. high-wear areas, they provide continuous protection against severe abrasion. Fast, easy change-out is made possible by the weld-on base and bolt-on runner design. 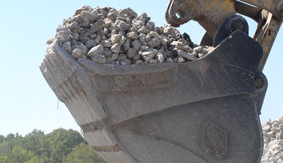 Protecting loader buckets from abrasive wear prolongs bucket life and protects your investment. Hensley offers a huge assortment of wear shrouds. Lip Shrouds Without lip shrouds, the leading edge of a bucket is exposed to constant abrasive wear. Hensley has a wide range of universal lip shrouds available in weld-on, and J-bolts styles for virtually any machine. Safe and easy to install in the field, Hensley’s hammerless fastening system for Whisler adapters eliminates the need for hammers. No lip modification is required for installation. The system fits existing Whisler lips with standard adapters.The XSC System features high usable wear material, high dipper fill rate, a 12 to 1 tooth-to-adapter ratio and a cost-saving reusable pin system. It is currently available for WH-10 and WH-12 and WH-8. Deliver a higher level of wear protection for abrasive soils, compact or dense clay, loose rock and gravel. Like HP Buckets, HPS feature a one-piece blade, side kick plate, full bottom wear plate and one-piece side plate, with a formed beam upper structure. The addition of horizontal wear strips on the bottom extends life in aggressively abrasive applications. The XS G.E.T. System comes standard. 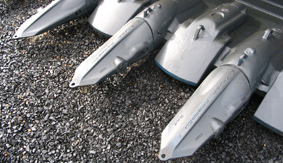 Optional sidecutters, strike-offs or weld-on vertical edge protectors are available. Ideal for utility work and for laying large pipe. It features teeth specially engineered for maximum performance. The round bottom is well suited to work in limestone, caliche-type materials, fracturable materials and soils compacted by deep frost. Research and real world experience have guided Hensley engineers to develop a range of economical, easy-to-use bucket protection products and accessories. 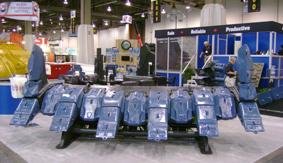 Weld-On Bucket Shrouds—Protect corner edges on excavators, loaders, face shovels and LHD scoop tram buckets. They’re cast for superior wear protection, and extended life for your equipment. 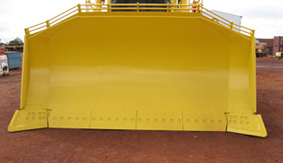 Lip Shrouds—Without lop shrouds, the leading edge of the bucket is exposed to constant abrasive wear. Hensley has a wide range of universal lip shrouds available in weld-on, and J-bolts styles for virtually any machine. 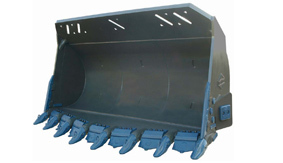 Vertical Shrouds—Vertical shrouds protect the cheek plates of excavator buckets. Hensley offers a large selection of vertical shrouds with different styles and sizes to match a wide range of equipment. Proprietary systems are available to retrofit any bucket, with the convenience of a pin-on system. Universal weld-on shrouds and direct replacements are also available. 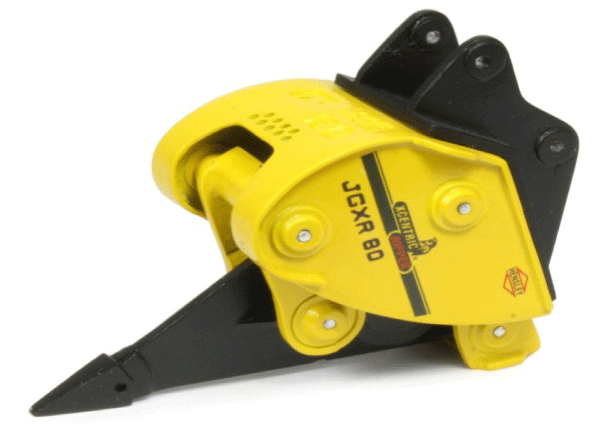 Sidecutters/Strike-Offs—Sidecutters protect the side plates of the bucket and add cutting width. Some accept combination plates for even greater width. Strike-offs protect bucket side plates and cut the same width as the bucket. LAMINITE®—Laminite® delivers the ultimate protection against impact and high abrasion in some of the harshest conditions. The result: reduced maintenance and less downtime. Features a wide cut and shallow digging profile that is specifically engineered for ditch cleaning, loam and sand. Are an effective tool for a variety of material handling applications that substantially increases an excavator’s versatility. 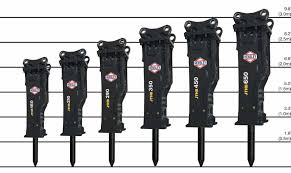 Several models are offered to better match the application including the mechanical weld-on, hydraulic direct pin, & hydraulic progressive link thumbs. Thumbs are composed of A514 (T1) steel and ideal for demolition work from grasping logs & brush to construction debris. Is Hensley’s new HF series for 60 ton and larger hydraulic excavators. 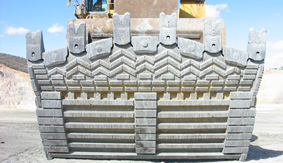 Flat bottom design beneficial for mass excavation / truck hauling application. Material type and material weight must be supplied to confirm bucket is suitable for application. HFP: Heavy Flat Plate – mass excavation , volume loading of same material as HFS plus, sandstone, most limestone and caliche, etc..
HFPS: Heavy Flat Plate & Strips – mass excavation, volume loading, a combination of HFS and HPS features. Bucket weight increased due to additional wear package. Capacity may be smaller depending on material type and density. Take a good thing and make it even better, delivering extreme-duty productivity and long life in shot rock, stratified materials, quarry work or any tough, highly abrasive application. 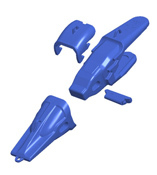 Features like increased wear material, cast heel wear shrouds and XS G.E.T. System put the HPX in a class by itself. 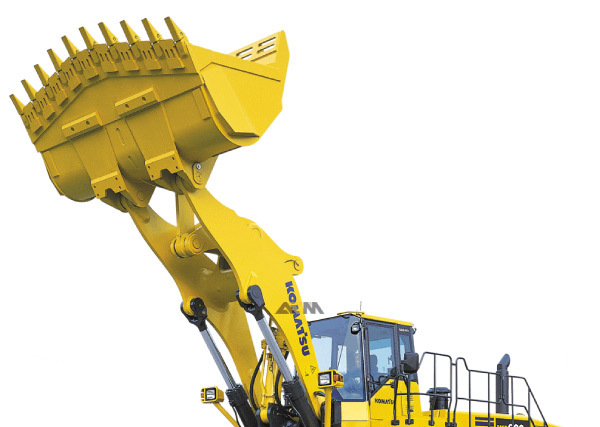 Multi-pin grabber units that pick up a variety of attachments including buckets, hammers, compaction wheels, rippers, and more for a wide range of excavators within the same weight class. Attachments can be easily changed within seconds from the operator’s seat without modifications which saves you time and money. Mechanical & hydraulic units are available to accommodate different applications and customer needs. For added security the hydraulic coupler has a double safety mechanism consisting of an automatic stopper lock and a pilot check valve while the mechanical unit has a lock plate to secure the adjustment bolt from loosening. With the versatility and safety features mentioned the Muroto Quick Coupler is the logical choice for all excavator customers. 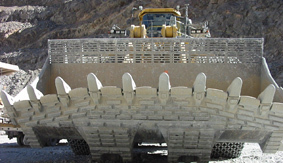 Designed with special teeth and adaptors to improve digging performance in limestone, caliche-type materials, fracturable materials and soils compacted by deep frost. Feature flatter floors and are recommended trenching and loading applications in dirt, loam, sand, gravel, loose clay and abrasive soils with limited rock. They are manufactured with a high strength tube upper structure, two-piece blade, horizontal wear strips on the bottom and a side wear kick plate. The XS G.E.T. System comes standard. 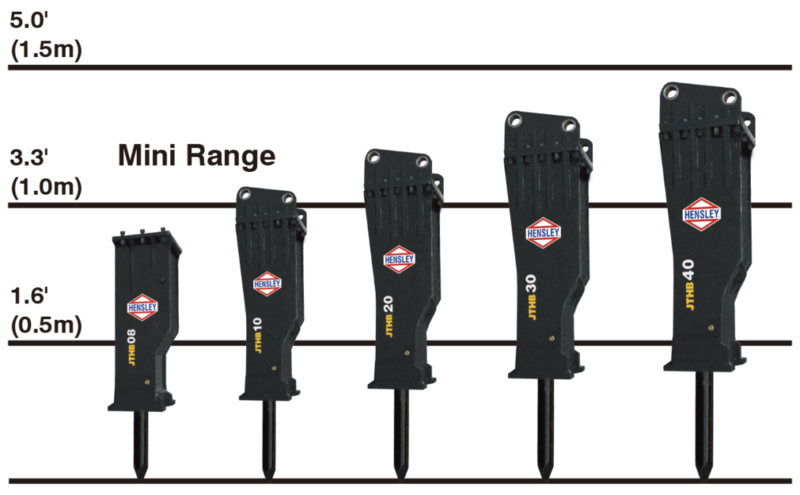 Optional sidecutters, strike-offs or weld-on vertical edge protectors are available. 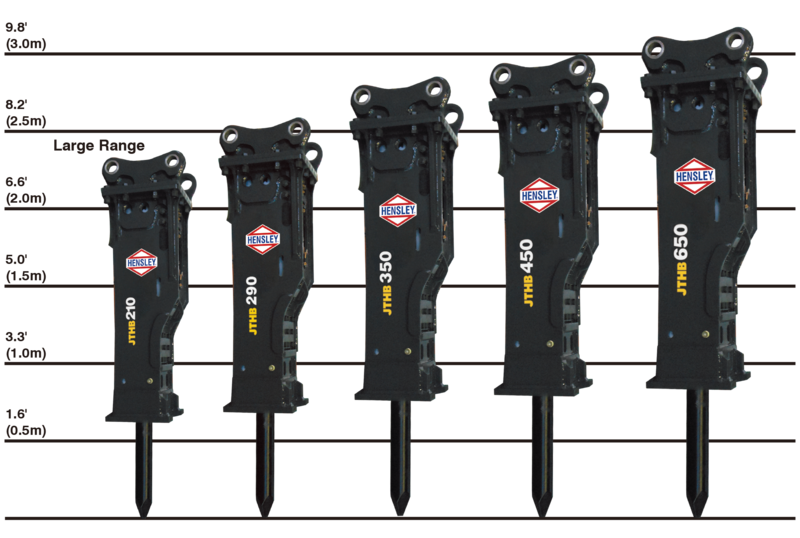 Whether you’re tearing out a reinforced concrete abutment, scaling a tunnel, or running a pedestal-boom at the quarry, Hensley hydraulic breakers provide you superior. Impact energy for exceptional performance in a variety of rock and concrete demolition applications. The high impact power of the JTHB Series breakers is delivered through a combination of hydraulic and nitrogen gas energy without the use of accumulators. This same nitrogen gas design provides recoil absorption to minimize shock to the system while storing energy for the next blow, contributing less stress and fatigue to the machine and the operator for a friendlier experience! Wheel loaders operate in every imaginable environment from loose sand and gravel to rock hard quarries. For every application there’s a rugged Hensley bucket designed for maximum productivity and bucket protection products that enhance their groundbreaking performance. Available in two types: Coal Digging and Coal Loading. Application is for loading coal from stock pile or digging direct from the coal seam. Coal loading bucket standard configurations: include straight lip or modified spade lip. Either a smooth lip with no protection made from 400bnh material; lip with weld on edge protector or bolt on edges. Coal digging buckets standard configurations: straight or modified spade lip with weld on flush mount or two leg wrap around adapter. Typically used in sand and gravel applications. Truck loading and material handling. Standard configurations: straight lip with bolt on reversible edges or cast half arrow edges and bolt on heel plates. 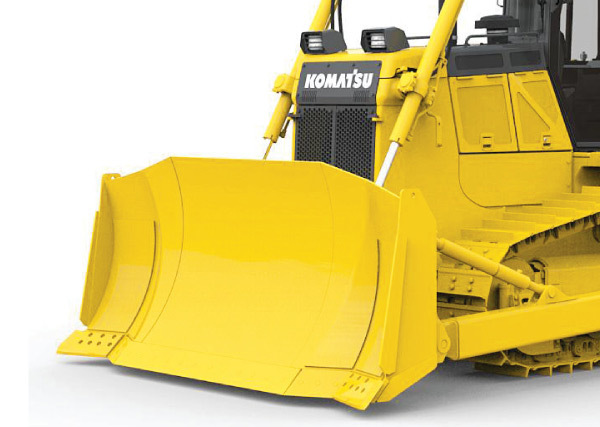 Our buckets are equipped with OEM base edges up to a 50 ton class loader that will allow for conversion to bolt on adapters and bolt on segments. Inside liners and vertical shrouds can be added on request. Used in applications that requires additional wear protection and greater penetration. Recommended for use in materials of low to medium abrasion. 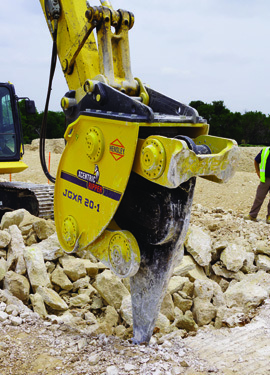 Dirt, compacted soil, shot or broken limestone, loose overburden material. Common configurations modified spade base edge with weld on adapters, bolt on segments, vertical shrouds, bolt on heel plates and optional liner. (Note: bolt on adapter arrangement available on most 17 to 50 ton class loaders) Inside Liner and Rock deflectors can be added upon request. Used in applications of extreme digging, high abrasion and high impact. 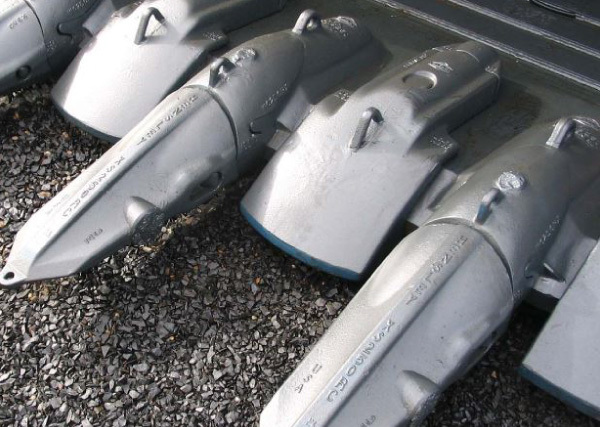 Standard configurations: Include modified spade base edge weld on adapters, cast bolt on segments with cast bolt on top covers, vertical shrouds, inside liners, rock deflectors and bolt on heel plates. J-Bolt mechanical lip shrouds can be used in place of bolt on segments in most cases. 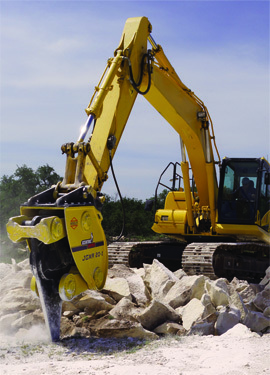 The Xcentric Ripper is an excavator attachment developed for high-performance rock excavation and demolition work. At production rates 2 to 5 times greater than a hydraulic breaker, the Xcentric Ripper allows you to finish jobs quickly and efficiently, saving you time and money. The complete line of Hensley blades and accessories offers uncompromising quality and superior performance, with configurations for most brands of mining, earthmoving and construction equipment. Innovative solutions are available in many variations, materials, types and sizes, all engineered to deliver maximum performance and long life. Hensley dozer blades are manufactured of heat-treated, through-hardened steel for maximum abrasion resistance and edge strength, with hot cupped end bits for extremely hard, highly abrasive conditions. Tungsten carbide embedding is available for added abrasion protection and extended wear life. Cast end bits maximize wear life and minimize waste. 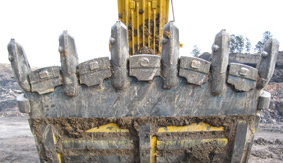 Count on maximum abrasion resistance and wear strength from Hensley excavator blades. They’re manufactured of heat-treated, through-hardened steel, with carbide embedding and serrated tooth blades available for an even higher level of protection and performance. For every material and every application you’ll find solutions from Hensley. Every application offers unique challenges. Hensley grader blades and accessories are engineered to fit specific needs, from earth moving to street maintenance. Easy to handle, easy to change, Hensley blades are available in many different variations, material types and sizes. Specialty blades such as serrated tooth, carbide tipped and carbide embedded products outperform standard blades in the most demanding conditions. Hensley offers a complete line of job-engineered loader blades and wear accessories for loaders in the toughest work environments. 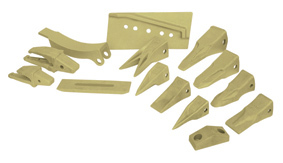 Cast or heat-treated, through-hardened blade segments and end bits are available for most major grader brands. Special products such as carbide embedded and arrow head blades outperform standard blades in the most demanding conditions. Our scraper blades are manufactured of heat-treated, through-hardened steel for strength and wear-resistance. They are available in various lengths and thicknesses, with drop-center sections for most equipment brands. Protect the scraper bowl from costly wear and damage with hardened steel router bits. Tungsten carbide embedding is available for added abrasion protection and extended wear life. XS is Hensley’s patented system of ground engaging tools that takes strength, durability, performance and productivity to the extreme. Our engineers analyzed where and how your machines work, and designed a system with a wide range of safe, economical and hard-working solutions.From loose dirt and crushed concrete, to the most abrasive mining applications, the high quality steel and unique design of the XS System minimizes downtime and maximizes productivity. From hydraulic excavators and loaders to draglines and cable shovels, XS improves safety and reduces costs. Advanced engineering and high quality steel standards give the TS System components a distinct advantage in performance, safety and economy. With products for virtually every application, the TS System features a high strength design that allows for smooth material flow. The reusable fastener system saves money without compromising safety and productivity. The Tooth Consumption Ratio for ground engaging tools indicates the percentage of available wear material on the whole tooth. 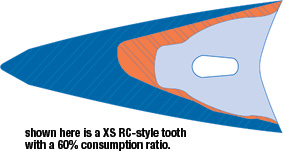 The greater the ratio (a percentage), the better the value because more of the tooth is used and less is thrown away. For example, a 25 lb. tooth with a 40% consumption ratio yields 15 lbs. of scrap material when the tooth wears out. A 25 lb. tooth with a 60% consumption ratio, would only scrap 10 lbs. of material. XS System teeth are designed for maximum consumption ratios and strength without unnecessary bulk. These teeth remain sharp and penetrating longer, so you keep working longer at a lower cost. Some teeth are hard on the exterior but their interiors are soft from interior heat treatment. Hensley XS System teeth are manufactured to a higher standard. All XS System teeth are heat treated to meet critical specifications for strength and durability. Installation and replacement have never been quicker or easier. Our simple, reusable fastener system saves time and money by unlocking with a simple 90-degree turn. Hensley’s patented XS2 System of ground engaging tools is specially engineered to meet the demands of the toughest mining applications. The unique square tooth design combines strength, durability and earth-moving performance with a one-piece, hammerless pin for quick, safe installation and maintenance. Hensley’s XSC System is engineered for performance, safety and economy under punishing mine conditions. Teeth feature high usable wear material and a shape that yields high dipper fills. Available for WH-10 and WH-12, there is no lip modification required for adapter installation; XSC fits existing Whisler lips with standard adapters. As with all Hensley products, safety is paramount in the XSC System design. The reusable pin system means there is no hammer needed for tooth installation or removal, and no need to work under the dipper to remove the lock. Safe and easy to use; no hammer needed for installation or removal. No lip modification required; fits existing Whisler lips with standard adapters. Available for WH-10 and WH-12. WH-8 coming soon. No need to work under dipper to remove lock. The Hensley line of ground engaging tools for construction and mining also includes a wide selection of Direct Replacement Parts for OEMs. These custom-engineered products can be used with Hensley loader and excavator buckets, and most other bucket brands. Delivers the ultimate protection against impact and high abrasion in some of the harshest conditions. The result: reduced maintenance and less downtime.This unique product, created in 1971 by Hensley Industries Australia, consists of a layering of white iron over mild steel. The steel backing cushions the white iron, enabling it to withstand extreme abrasive conditions.Available in a variety of shapes and sizes, Laminite is easily installed to most high wear areas on mining and earthmoving equipment, or any application needing extreme protection, including the steel, cement, coal, glass, sugar cane and wood chip industries. Delivers the ultimate protection against impact and high abrasion in some of the harshest conditions. The result: reduced maintenance and less downtime. This unique product, created in 1971 by Hensley Industries Australia, consists of a layering of white iron over mild steel. The steel backing cushions the white iron, enabling it to withstand extreme abrasive conditions. Available in a variety of shapes and sizes, Laminite is easily installed to most high wear areas on mining and earthmoving equipment, or any application needing extreme protection, including the steel, cement, coal, glass, sugar cane and wood chip industries. XS and TS Series adapters and teeth for safe and easy installation and replacement.